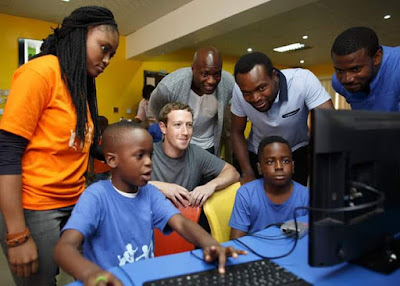 Facebook CEO Mark Zuckerberg is in Nigeria on his first trip to Africa, using his time in the country to visit the Yaba technology hub in Lagos, meet with developers and partners, and explore Nollywood. One of his first stops on the trip was to visit a 'Summer of Code Camp' at the Co-Creation Hub (CcHub) in Yaba, known as the Silicon Valley of Nigeria. CcHub opened in 2011 and at the time didn't even have an office. Five years later they fill three floors and the roof of a building. At CcHub people can learn how to code, developers can get help launching their first products, and find mentors and funding. 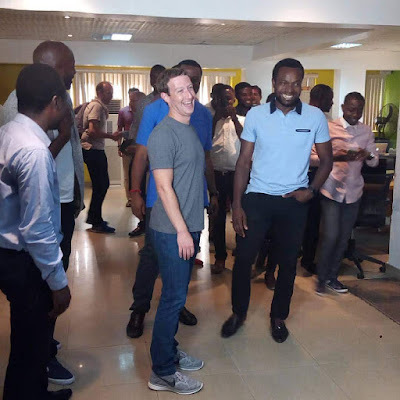 At CcHub Zuckerberg met with developers like Temi Giwa, who runs a platform called Life Bank (http://www.LifeBank.ng) that makes blood available when and where it is needed in Nigeria. Life Bank saves lives by mobilizing blood donations, taking inventory of all blood available in the country, and delivering blood in the right condition to where it is needed. After visiting CcHub Mark Zuckerberg, CEO of Facebook, said: “This is my first trip to sub-Saharan Africa. I'll be meeting with developers and entrepreneurs, and learning about the startup ecosystem in Nigeria. The energy here is amazing and I'm excited to learn as much as I can. Earlier this year, the Chan Zuckerberg Initiative invested in Andela after being impressed by the company's innovative model of learning and its drive to connect the global technology ecosystem with the most talented developers in Africa. Seni Sulyman, Director, Andela Lagos, said: “We are excited and honored to welcome Mark Zuckerberg to Lagos. His visit reinforces not only his support of Andela’s mission, but his belief that indeed the next generation of great technology leaders will come out of Lagos, Nigeria and cities across Africa. Andela has created a platform for passionate, driven software developers and engineers to break into the global tech ecosystem, but the barriers to entry are still very high. Mark’s visit demonstrates to all Nigerian developers and entrepreneurs that they’ve caught the attention of the tech world, and they are capable of succeeding on a truly global level."